Prime Minister Manmohan Singh and his supporters are singing “Walmart is Comin’ to Town” just like the old Christmas tune (You better watch out, you better not cry…Santa Clause is comin’ to town). And like Santa, Walmart is preparing to hand out the goodies. The mega-corporation is going to hire lots of Indians and promises to sell Indian made goods, both perishable and nonperishable, at “Always Low Prices, Always” (Walmart’s old slogan). However, before one joins in Singh’s carol, one needs to examine some of Walmart’s practices. Walmart buys products from its vendors at a price it sets and then sells them below market prices in order to drive the competitors out of business. In 2003, a case against Walmart was filed in the German courts for keeping the prices artificially low. The case went to the German Supreme Court and it ruled against Walmart’s way of pricing goods and said it was undermining the competition. Following the ruling, Walmart left Germany for good. Walmart’s products are not always of a good quality. It once sold jewelry made in China in its US stores. The jewelry was found to contain toxic metal cadmium responsible for bone and kidney diseases. Walmart imports many items in the USA from foreign countries, and its biggest trading partner is China. The USA has a large trade deficit with China, and Walmart is somewhat responsible for this. While its business with China is booming, other US businesses are affected and are not able to sell their merchandise to Walmart. Walmart has over two million employees worldwide, but it offers low-wage work. Generally, more than 50 percent of its employees leave within one year. Labor management relations are not always smooth. Walmart has been part of many lawsuits, which have to do with issues related to wages and working conditions. Moreover, Walmart does not provide health insurance to many of its employees, so when they get sick they end up in the public hospitals since they are often uninsured. Indirectly, taxpayers are paying for the employees’ medical treatments. It is unlikely that Walmart is going to buy all the products made in India all the time. So, how many Indian manufacturers or farmers or service providers are going to benefit from having Walmart (or other foreign-owned retail companies) in India. In fact, it may cause more harm than help if large volumes of foreign- made goods are dumped in India. If we allow Walmart now, it is like having a giant rakshas coming to battle with tiny store owners. The playing field is not level. It is worth looking into an economic model that encourages Indian businesses to build giant superstores to proudly sell products made in India and by Indians. After we have established this, then we might welcome foreign retailers. So, before we roll out the red carpet for Walmart (and others) and raise the volume of the tune (Walmart is Comin’ to Town), let’s seriously consider the consequences and the “benefits” that such a store might bring to India. Mr. Seth, you made good points:Walmart could turn "friend to foe" and Gandhiji called to boycott "Videshi Goods". Many say Walmart will bring dollars. Yes, they'll come to India with dollars to build stores and buy products to sell. But what will happen to the profit they'll make in India in rupee currency? Won't they convert from rupees to dollars so it can give dividends to their American shareholders? If the value of rupee falls, they'll take fewer dollars home to America, and vice versa. To prevent a loss from currency exchange, they may convert rupee into dollar frequently, putting pressure on rupee. Americans built America. They didn't ask foreign companies to come to America and manufacture or sell products and hire Americans. There is a notion among our leaders that let us go bring foreign companies to India and create work for unemployed Indians. Indians will have to build India, just like Indians will have to defend India. This how I understand your point of "videshi." dollars in India, provided it agrees to buy and sale goods made only in India. 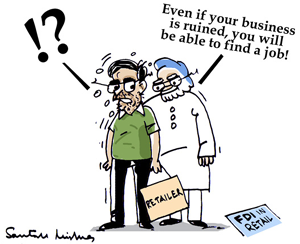 It may start manufacturing goods in India. is trying to put indian farmers and retailers out of business. Man Mohansingh. They should learn lesson from Germany where Subhas Chandra Bose went. It is pity that UPA does not learn lesson from the past.